I inherited my grandmothers very large collection of costume jewelry. For the last several months I have been using the damaged beads and odds and ends in my handmade watercolors. 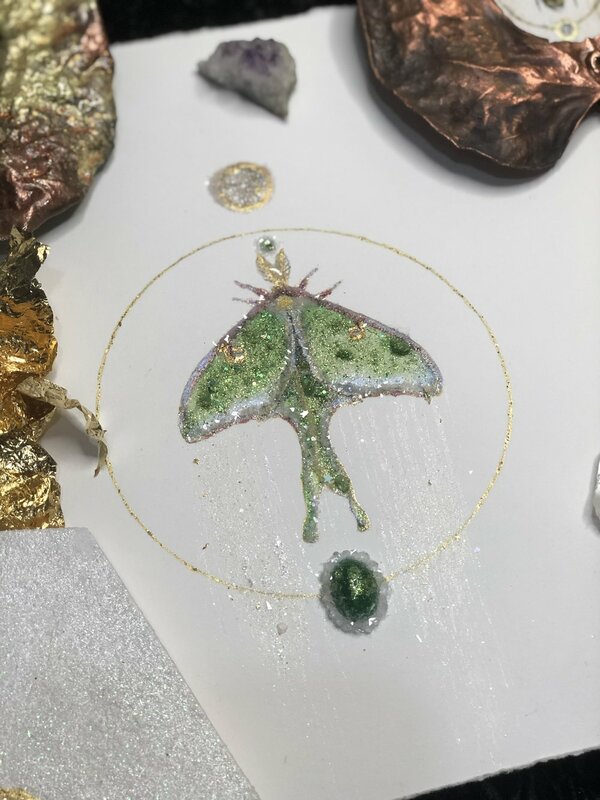 The green bead on the bottom came from her collection and inspired the luna moth above. Am I better? Am I worse? I don’t know. I have always been bad. My brain just thinks visually. Impulsively. I have always made art with my intuition. Writing is not like that. It’s planned, it’s ordered. There are rules. Bear with me while I figure mine out. I am kind of having fun though, figuring out my words. So thank you for sticking with me. The blue bee is a personal favorite of mine. They are so magical in reality, they do not seem real. This painting was made with handmade watercolors. My watercolors are extremely unique, because they are made out of various textures and found materials. I use semi-precious stones, mica, glass, glitter, and antique beads. I adorn each piece with gilding (gold, silver, or copper leaf). This piece is gilded with 23k gold leaf. This piece is framed in an antique frame. I tirelessly collect these antique frames. This is a beautiful gold and dark red, wood frame that is approximately 4’’x6’’. Ready to hang on your wall. Do not hesitate to ask me any questions! This lovely lacewing turned out beautiful in this tiny box frame. It can hang on the wall, or be set on a shelf so you can pick it up and enjoy it. This piece is adorned with a Swarovski Crystal and 23k gold leaf. These paintings are made with handmade watercolors. My watercolors are extremely unique, because they are made out of various textures and found materials. I use semi-precious stones, mica, glass, glitter, and antique beads. I adorn each piece with gilding (gold, silver, or copper leaf). Last year I kept saying it was the year of the luna moth. This year it is the year of the blue morpho. They have been my most requested painting of the year, and you can understand why. It was so inspiring to design the special blue ink that was used on this piece. This piece is framed in an antique frame. I tirelessly collect these antique frames. This is a beautiful oval frame that is approximately 4’’x6’’. Ready to hang on your wall. This tiny 2’’x3’’ honey bee is meant to seem real. He is on his way to and from the honeycomb. This is a handmade watercolor painting that is adorned with 18k gold leaf. Framed in a honeycomb pattern frame and ready to hang on your wall. 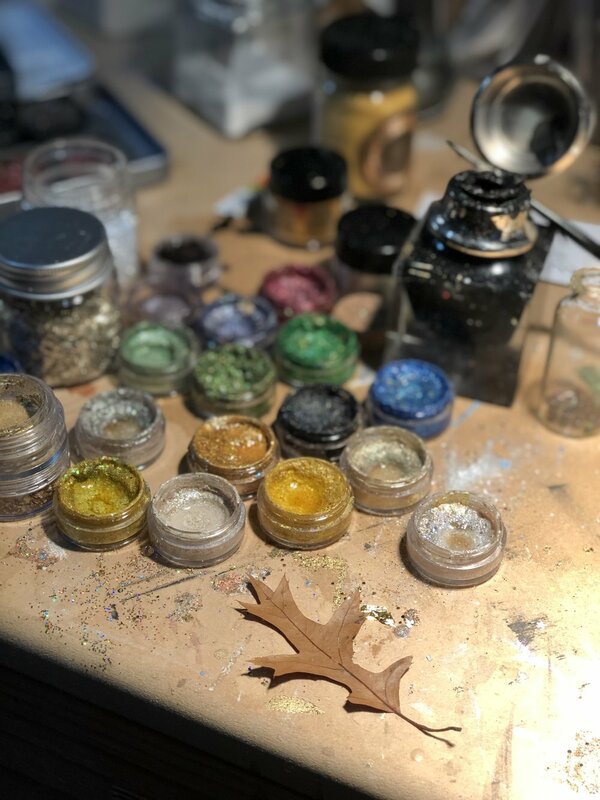 This tiny oak leaf is meant to sparkle and shine in many different ways. This is a handmade watercolor painting that is adorned with Swarovski crystals and 23k gold leaf. This really is a sweet little painting. Ready to hang on your wall. This painting was made with handmade watercolors. My watercolors are extremely unique, because they are made out of various textures and found materials. I use semi-precious stones, mica, glass, glitter, and antique beads. I adorn each piece with gilding (gold, silver, or copper leaf). This piece is gilded with 18k gold leaf. This piece is framed in an antique frame. I tirelessly collect these antique frames. This is a beautiful round, brass frame that has butterflies cut out of it. It is approximately 3’’x3’(inside) and 6’’x6’’ outside’. Ready to hang on your wall. This piece is like a fine piece of jewelry for your wall. It is interesting from so many angles. And it comes with some surprises. It is painted on a birch panel that is cut in a hexagon. 7’’x7’’. It is ready to hang on your wall. This moon is adorned with 18k gold leaf. It comes matted and ready to fit in a standard 5’’x7’’ frame. Pick your mat color below. I have been asked so often lately about my materials. I have a really hard time answering, because my material list has gotten rather complicated over the last year. I don’t think I can answer the question in one post, but I will try to start talking about it more here and there, starting now. I guess today I would like to prelude the question with some background. I was a painter, then I was a printmaker, and now I am an artist. I am an alchemist. I am a witch. And that is how I look at my process and materials. I am often asked at art fairs how long I have been doing this. And I always say, forever. I had an overwhelming impulse to make things from a young age. I think this is fairly common amongst artists. My clearest memory is sewing quilts, and creatures, and things. Then, I tried to work with every material and technique I could get my hands on. I am an only child, and I was always trying to occupy my mind. But the impulse never went away. Except after graduate school for a handful of years, but that is a story for another day. Other artists out there, what is your experience? When did you start your journey as an artist? Oh boy, this writing thing is hard to do when life interferes. That paired with finding writing difficult to begin with, I just don’t wanna do it! But I must. And I will. Because this is kind of important to me. So, now I am sick too! Sore throat and misery all over. Rose is still sick. Brennan is cranky, but I don’t know. My pediatrician informed me that kids under 2 can get sick 10-14 times a year! And this is the back-to-back season for babies. It’s been rough, to say the least. I won’t say anything will be back to normal soon. Because with two toddlers, nothing is ever normal. Yesterdays post was delayed. My daughter has a virus and has a terrible cough at night. I have had to stay up with her through the night, and I am exhausted! Steamy showers, VICS, repeat. Anyone have any other tips for a 1 year old sick baby? Today I am in the studio, enjoying a day of painting, writing, and fighting off the exhaustion after two nights of no sleep. Luckily I have help with the kids today, so I can finish up a few commissions and write a little bit about my materials. There seem to be quite a few people interested in this. Please keep the questions coming. This gives me something to write about! Today was just a something day. I had to run the kids to a couple appointments. Far less painting went on that I had anticipated. But, I guess you could say I had a breakthrough moment after finishing this painting on panel. It has been far too long since I worked on panel, and I think I am finally ready to add it to my repertoire. I don’t know what to write about today. There are a lot of ideas running through my head. But also nothing in particular to go on about. I mostly took care of Brennan and Rose, and ran errands during the day. In the last hour, I was finally able to finish the new series of moons. I will post them on my website later this week. Today I went sledding with Brennan and Rose. I was reminded how inspiring winter can be. I am one that easily get caught up in the negative aspects of winter. Season depression hits me hard, and I hate the cold. But today it was so bright, and the snow was light and sparkled like one of my paintings. That paired with watching the joy on my children’s winter kissed faces, how could I not be inspired. I have to remind myself that spring is birthed out of winter. So there must be good in it. I also ran into my high school art teacher. This was a huge thrill, because it was the first time I had seen her since I graduated 13 years ago. So many memories came flooding back. Ugh, the frustrating years of adolescence. The angst, the pain, the agony! Art was my therapy. And now it is my day job. Mrs. Ragotzy was a big part of those first few years, so I have a lot to thank her for.